What: The Screaming Eagles loook to play spoiler as the Empire fight for a playoff spot in the Intense Conference. Note: Per OurSportsCentral, this may be the final game for the Screaming Eagles in the IFL. The Empire are 8-7 overall, 3-4 on the road and 7-4 in conference play. Spokane is coming off a 28-58 road loss to the Iowa Barnstormers on June 9. They are averaging 40.8 points per game (7th in IFL) and are allowing 42.1 points per game (6th). The Empire are third in the Intense Conference. The Screaming Eagles are 4-11 overall, 2-5 at home and 3-8 in conference play. Salt Lake is coming off a 34-37 road loss to the Green Bay Blizzard on June 10. They are averaging 42.0 points per game (6th) and are allowing 48.0 points per game (8th). The Screaming Eagles are fourth in the Intense Conference. 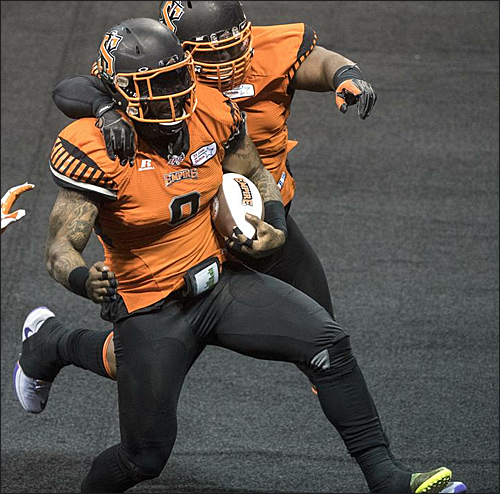 The Spokane Empire were shot down by the Iowa Barnstormers last week, 58-28, letting another opportunity to take control of their playoff destiny slip through their fingers. It’s been a freefall for Spokane, who have fallen from first to third place in the Intense Conference. After a 7-2 record halfway through the season, Spokane has lost 5 of their last 6 games, struggling to score more than 36 points in each loss. 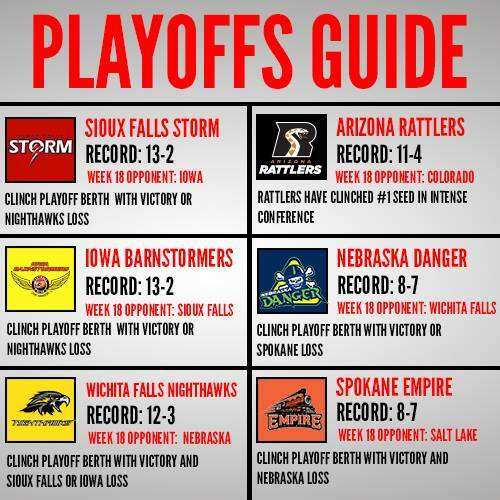 The Empire caught a tremendous break with the Nebraska Danger falling to the Sioux Falls Storm last week, and have one more opportunity to keep their playoff hopes alive. If they can beat the Salt Lake Screaming Eagles, who are likely playing their last game in the IFL, and Nebraska loses to the Wichita Falls Nighthawks, Spokane is in. If Spokane wins, but Nebraska upsets Wichita Falls, the season is over. If Spokane loses, the season is over. The pressure to get back to the Intense Conference Championship is high, and the Empire have to get back on the rails if they want a chance to make some noise in the postseason. After QB Aaron Wilmer struggled for the second consecutive week, rookie QB Marcus McDade will likely get the start against the Screaming Eagles. Although he was able to rush for 46 yards, throwing accuracy and throwing power was again an issue for Wilmer, who was 8 of 15 for 43 yards, 1 TD and 1 INT. McDade played the second half, but his inexperience showed as he completed 4 of 12 for 38 yards. The positive is that he had a rushing touchdown and was able to guide the Empire to four scoring drives. With a week of practice under his belt, the hope is McDade will accumulate to the indoor game and help get the Empire back into the win column. McDade may not have the speed of Wilmer in running the football, but he has a better touch throwing the football with a small field. The key to the Empire’s success on offense will lie upon its running game, which has been held in check over the last two weeks. In three games against the Salt Lake Screaming Eagles, the Empire have amassed over 100 yards rushing. OS Trevor Kennedy (69 rushes, 286 yards, 9 TDs) had a monster game in the first meeting, rushing for 101 yards and 3 TDs in a 41-35 win back in March. RB Mulku Kalokoh got starts in the next two meetings. A potential x-factor for Spokane could be the running style of Andrew Pierce (19 rushes, 80 yards, 2 TDs), who has been averaging 4.2 yards per carry through three games. Pierce brings a more physical running style than that of Kalokoh, which presents a mix if power to go with Kennedy’s finesse. Salt Lake has improved over the last quarter of the season against the run, allowing an average of 86.4 yards per game, but have given up the second highest amount of touchdown runs (22). Establishing the run should be a tremendous help to Spokane’s slumping passing game. Leading WR Bryan Pray (57 receptions, 613 yards, 16 TDs) could have played a big factor against Iowa, but was ejected after a questionable penalty by the officials. Pray had caught 3 passes for 19 yards and 1 TD and looked to have the start of a big evening ahead. Getting the ball to Pray, who possesses dynamic big play capabilities, will be a great benefit for McDade. Devonn Brown (40 receptions, 425 yards, 9 TDs) registered multiple passes last week, snagging 3 passes for 27 yards, but was held out of the endzone. The presence of Pray could help Brown and provide opportunities for the versatile Trevor Kennedy. With Samuel Charles (30 receptions, 407 yards, 10 TDs) looking like he’ll be out for the third consecutive game, look for Orlandus Harris Sr. (6 receptions, 77 yards, 2 TDs) and ex-Shock receiver Rashaad Carter (2 receptions 18 yards) to try and break through to provide opportunities for McDade. They’ll have to be physical against Salt Lake’s young but talented DBs like Ed Burns (61 total tackles, 4 pass breakups), Rashad Greene (51 total tackles, 7 pass breakups), and James Calhoun (41 total tackles, 9 INTs, 6 pass breakups). Statistically, the Empire’s defense has slipped within recent weeks, but stats don’t tell the whole story. The defense has held its own during the recent skid; outside of the losses to Iowa and Sioux Falls, the Empire have lost by 17 points or less, which isn’t a wide margin in terms of arena/indoor football. This week, they face a Salt Lake offense infamously run by the fans courtesy of the playcalling app developed by Project FANchise. The Screaming Eagles’ biggest offensive weapon is rookie QB Verlon Reed, who would be considered an MVP Candidate if he played for a team with a winning record. He’s thrown for 2,615 yards, 49 TDs, and 17 INTs, this season, and ranks second in the league in passing yards per game (174.3) and third in passing touchdowns. His dual-threat ability makes him dangerous; he leads the Screaming Eagles and the IFL with 715 rushing yards and ranks second in the league with 47.7 rushing yards per game and fifth with 15 rushing touchdowns. Reed has had success at times against the Empire, but mistakes have doomed the Screaming Eagles from earning three potential wins. The Screaming Eagles haven’t seen success this year running the football with their running backs, but RB Lucien Walker could provide a dual-threat headache. He’s got 57 total yards in 3 games, including a 44 yard and 2 touchdown performances in a 64-27 win over the Cedar Rapids Titans. LBs Nick Haag (68 total tackles, 5 sacks, 7.5 tackles for loss, 3 pass breakups) and Andrew Jackson (97 total tackles, 4 sacks, 1 INT, 5 pass breakups) will be tasked with not only getting pressure on Reed, but to keep him from ripping off chunks of yardage on draws or scrambles. DLs J.D. Griggs (50 total tackles, 10.5 sacks, 16.5 tackles for loss), Kaelin Burnett (17 total tackles, 1.5 tackles for loss) and OL/DL Bill Vavau (7 total tackles) will be tasked with getting pressure on Reed into making mistakes, which has plagued the Screaming Eagles throughout the season. The team made some transactions this week regarding the DL and the LB spots. Harold Love (36 total tackles, 1 sack, 6 tackles for loss) was released this week, and the team signed ex-Georgia State DL Terrance Woodard for depth. The Empire also signed veteran IFL LB Joseph Thornton to the active roster, likely to play at linebacker while Andrew Jackson moves back to the defensive line. Joseph has played with the Colorado Ice and the Tri-Cities Fever, and has even had a stint with the CFL's Montreal Alouettes. The Empire’s defensive backs are going to be facing a tough task of handing Salt Lake’s wide receivers, which have tallied up the statistics this season. WR Devin Mahina is the team’s star receiver with 72 receptions for 788 yards and 15 touchdowns. WRs Juan Dotson (36 receptions, 259 yards, 6 TDs), Cy Strahm (36 receptions, 395 yards, 7 TDs), Chris Robinson (30 receptions, 405 yards, 8 TDs), and James Poole (27 receptions, 254 yards, 3 TDs) have had success in the passing game. DB John Hardy-Tuliau (78 total tackles, 6 INTs, 9 pass breakups) has the most veteran presence on the team as veteran Tyree Robinson (75 total tackles, 2 INTs, 12 pass breakups) was placed on Season Ending IR this week. The concern will focus on rookies Antoine Tharpe (27 total tackles, 4 pass breakups) and Qua Cox (10 total tackles, 2 pass breakups), who have experienced growing pains in their brief time with the Empire. Spokane has to contain Salt Lake’s wide receivers; if they can’t, it could be a long night defending against Verlon Reed’s passing attack. The game is essentially a playoff game for Spokane. If they lose, their season is over. Look for a sense of urgency from the team as they face Salt Lake. If they don’t take the Screaming Eagles seriously, it could be a long off season for the Empire. This is a team without a future. This is a team about to play its final game, but this is a team which still has something for which to play. The owner of the Screaming Eagles, Project FANchise, have announced plans to begin an interactive football league of eight teams in one location. Most reports are speculating that will be in Las Vegas. The organization's principle owner, Sohrob Farudi, has confirmed the Screaming Eagles will fold at the end of this season. FANchise owns the Colorado Crush as well. If buyers are not found for either team, their IFL tenures will come to an end. But again, there are still some reasons to play. The most notable is that these guys love football. To get out there on the field one more time would help fulfill that passion for the game. Even more so for some players, who could be looking at a training camp invite to an NFL team roster, or be picked up by a team in the Canadian Football League. Some could be looking at finding a roster spot in with another IFL team in 2018. These guys are going to be playing at a high level in this game, looking to put some more game film together and looking to impress some scouts. Quarterback Verlon Reed, wide receiver Devin Mahina and defensive back James Calhoun could be at the very top of those teams and scouts' lists. The team as a whole is looking to get a little payback against a team which has defeated them in all three of their previous meetings this season. The Screaming Eagles would love nothing more than to end their season on a high note against a Spokane Empire team which has struggled over the second half of the season. In the teams' first meeting on March 13, Reed's four yard pass to Mahina drew the Screaming Eagles to within six points with 56 seconds left, but the Empire were able to run out the clock in the final minute to secure the 41-35 win. Eleven days later, Spokane opened up a 24-10 halftime lead and held on for the 53-36 win. The third meeting, on April 30, came down to the final seconds. Reed found Juwan Dotson for a four yard touchdown to bring the Screaming Eagles to within two. Reed's pass for the two-point conversion was intercepted, allowing the Empire to escape with the 31-29 win. Reed is second in the IFL in passing yards per game at 174.6. His 715 rushing yards are is first in the league, and he is second in the league in rushing yards per game at 47.7. Both marks also are first in the IFL among quarterbacks. Reed has been one of the true bright spots for the Screaming Eagles this season. It's a sure bet that he will be playing for some team next season, if not this fall. There are even a couple IFL teams who could be shopping for a quarterback this season and Reed could be an excellent find for them. Mahina, who played tight end at BYU, is a huge target at 6'6” who can be dangerous in red zone situations. He's fourth in the IFL in receptions with 72, Trailing only Jordan Jolly of the Wichita Falls Nighthawks (92), and Tre Parmalee (79) and Damond Powell (75), both of the Cedar Rapids Titans. Parmalee and Powell's numbers are aided by the fact the Titans have already played their 16th and final game of the season. Scouts are undoubtedly already taking a hard look at Calhoun. He leads the league in interceptions with nine, and has returned six of those for touchdowns. Calhoun has at least one interception in each of the past three games. In addition to Reed and Mahina on offense, there is even more talent there. Chris Robinson is a deep threat receiver who also will carry the ball on occasion. Dotson, who has not been utilized as of late, could make an impact of his own. Delric Ellington could also fit into the mix. James “Bubba” Poole and Lucien Walker will try to pick up the slack in the running game. Defensively, Salt Lake has a strong backfield. Calhoun, Ed Burns and Rashad Greene are all capable of disrupting plays in the passing game. Jerome McElroy, Seante Williams and Quinton Bradley are tasked with putting pressure on the opposing quarterback. What the Screaming Eagles defense will need to do is shore up the run defense. Defending the run has been their Achilles heel all season, and it won't get any easier as they set to do battle against Trevor Kennedy and Andrew Pierce of the Empire. Robinson and Calhoun will likely each get some run in the kick return game, and both are capable of returning one to the house. In order to win this game, the Screaming Eagles will have to be meticulous on offense. It sounds a bit cliché, but take what the defense gives them. Turnovers and penalties will be a detriment to Salt Lake's hopes. It's unsure whether the Empire will start Aaron Wilmer or Macrus McDade at quarterback, but both are young. That could be an advantage to the Screaming Eagles defense, who will have to be opportunistic and look to make a big play. Empire QB Marcus McDade on the team's bid for the playoffs. "We had a real chance to control our own destiny, and we didn't, which we didn't capitalize on, so we really want to capitalize on this situation." Empire Head Coach Adam Shackleford on if his team makes the playoffs. "If we get in, after everything we've dealt with - 10 guys [on] IR, having to play the same day we traveled at last minute by league decision - all the stuff we dealt with? Our guys definitely deserve that." Shackleford on the Empire's struggles in the second half of the season. "Our red zone efficiency is horrible, our turnovers in the red zone are embarrassing. If those things don’t stop, we’re not going to be a contender even if we get in the playoffs." 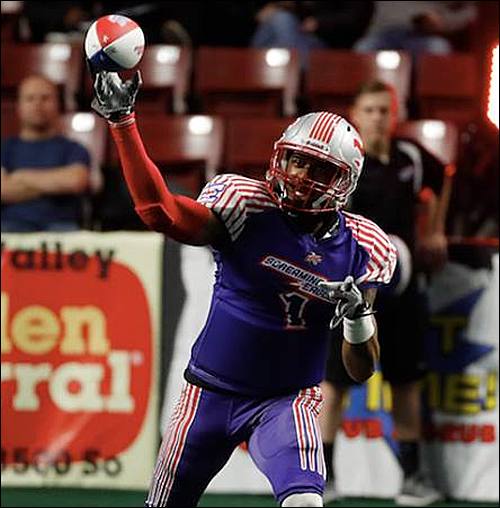 Shackleford discussing Marcus McDade's performance against the Iowa Barnstormers last week. "I thought Marcus played well. He’s a big-body guy, throws the ball very well, throws on time and he plays with a lot of confidence." June 16 - Arizona Rattlers (11-4) at Colorado Crush (3-12), 6 p.m.
June 17 - Sioux Falls Storm (13-2) at Iowa Barnstormers (13-2), 5:05 p.m.
June 17 - Wichita Falls Nighthawks (12-3) at Nebraska Danger (8-7), 5:05 p.m.
At 8-7, the Spokane Empire sit in third place in the Intense Conference just behind the Nebraska Danger (8-7). The Danger hold the tiebreaker over the Empire thanks to 42-36 victory on April 1st. The Empire still have a chance to clinch a playoff berth by defeating Salt Lake and Nebraska losing to the Wichita Falls Nighthawks. Should the Empire fail to make the playoffs, it'll mark only the second time that Spokane has not played in the post season. The one and only time Spokane failed to make the playoffs was 2012, when the team was still known as the Spokane Shock. In that season, Spokane rebounded from a 1-3 start to finish the season at 10-8. In spite of the 10-8 record, Spokane finished last in the AFL's National Conference West Division due to superior play of the Arizona Rattlers (13-5), San Jose SaberCats (12-6) and Utah Blaze (12-6). 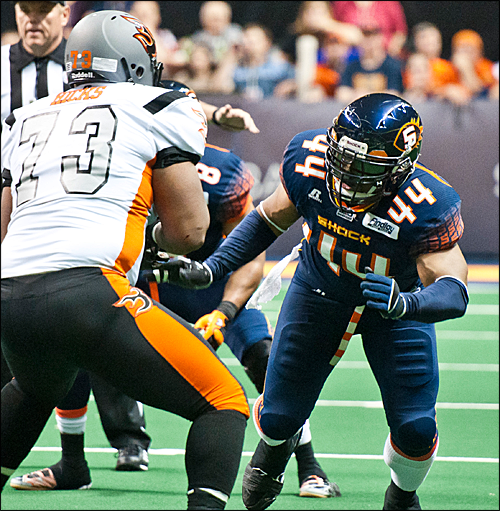 Click here to read all about the 2012 Spokane Shock. This is the Screaming Eagles game to win IMO. At this point in the season I would say they are superior to the Empire. As inconsistent as he was, getting rid of Dowdell was a mistake as either Wilmer or McDade ended up not being improvements. I think this game will also have implications on the Danger-Nighthawks game in this sense of, if the Screaming Eagles win, the Danger have nothing to play for and may not play as hard or put in backups in preparation for the playoffs. If Spokane wins, then the Danger-Nighthawks game will be a classic "do or die" game for both teams. Should be interesting either way. Great been how close the last game was, I would predict a toss up tonight. The Empire have more to play for, but hey have struggled at the quarterback position for the past few weeks. It's going to be an interesting weekend with three of the four games having major playoff implications. I think this game will also have implications on the Danger-Nighthawks game in this sense of, if the Screaming Eagles win, the Danger have nothing to play for and may not play as hard or put in backups in preparation for the playoffs. If Spokane wins, then the Danger-Nighthawks game will be a classic "do or die" game for both teams. Should be interesting either way. These are my favorite previews. By that I mean when we have independent input from multiple people. Great job guys! 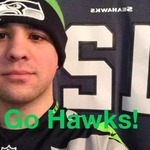 I am looking forward to a great game tonight. David is going to handle the score updates, and I will have the quarter summaries. I will also have updates from the Crush-Rattlers game. Something tells me I'm going to be one of the few people on Twitch that has an idea of how IFL football works. Angi will be flying solo on that game thread! Keep her company! Spokane has won the toss and will get the ball first. Early penalty for the Empire. Not a good way to start your first drive after a decent run. Referee warned the Public Address announcer to shut the music down when they're huddled up. You'd think they would have caught that before the 8th home game. Touchdown Empire. Andrew Pierce 15 yard run. PAT botched. Nice work by the Empire on that first drive. Touchdown Screaming Eagles. Chris Robinson 10 yard pass from Verlon Reed. Thomsen kick.